Frustrated at having to queue at Temple whilst the roadworks continue on the A30? If time and leisure allows why not avoid all that tarmac hassle – at least for a short while - by turning off at Bolventor (if you’re travelling north) or towards Colliford (on the southern route) and discovering a secret spot well-known for its Arthurian connections. Dozmary Pool is remote and mystical. Set in the heart of Bodmin Moor, surrounded by barren, wild terrain, it has changed little over thousands of years and requires some bumpy track driving or walking to find. I chose the former, following my Sat Nav which took me very close. Standing by the water’s edge, looking into its grey, gently ruffled surface, the frisson of legend quickly took hold. This is the place where, according to one version of the famous story, King Arthur is said to have rowed out and been handed the sword Excalibur by the Lady of the Lake. Imbued with magical powers, Excalibur helped Arthur defend his realm against Saxon invaders. When the King lay dying after his final battle against Mordred at Camlann (possibly located near the River Camel which rises on Bodmin Moor and joins the sea thirty miles away on the north Cornwall coast), he reportedly tasked Sir Bedivere with returning the sword to its mythical owner. Twice the knight tried to follow his sovereign’s instructions and throw the beautiful weapon into the pool but, on each occasion, found he couldn’t do it. Eventually persuaded by Arthur that he must carry out this one last act of loyalty, he stood amongst the reeds and boulders and flung it. An arm ‘clothed in white samite, mystic, wonderful’ appeared from the water, caught Excalibur by the hilt ‘brandish’d him three times, and drew him under in the mere’. Is Excalibur lying somewhere at the bottom of Dozmary Pool? Certainly it wasn’t discovered when the lake dried up in 1869. There were some Neolithic arrowheads but no sign of an ancient, bejewelled sword ‘twinkled’, according to Tennyson, ‘with diamond sparks, myriads of topaz-lights and jacinth work’. No sign of a sorceress either. Another myth generated by this unfathomable stretch of water is that of Jan Tregeagle. A cruel man during his lifetime in the early 1600s, he is said to have been a local magistrate who sold his soul to the Devil in return for money and power. Like all Faustian fiends he eventually got his come-uppance with an eternal punishment of emptying Dozmary Pool with a holed limpet shell. Some say you can hear his terrible howling on stormy nights as he bemoans his hopeless, never-ending task. Dozmary Pool flows into nearby Colliford Lake, a nature reserve run by the South West Lakes Trust that covers 900 acres and is regarded as Cornwall’s best brown trout fishery. It’s also an important site for bird life, including over-wintering fowl. I drove there after visiting the Pool and was frankly amazed that such a vast stretch of water existed in an area synonymous with large expanses of bleak, dolefully marvellous wilderness. 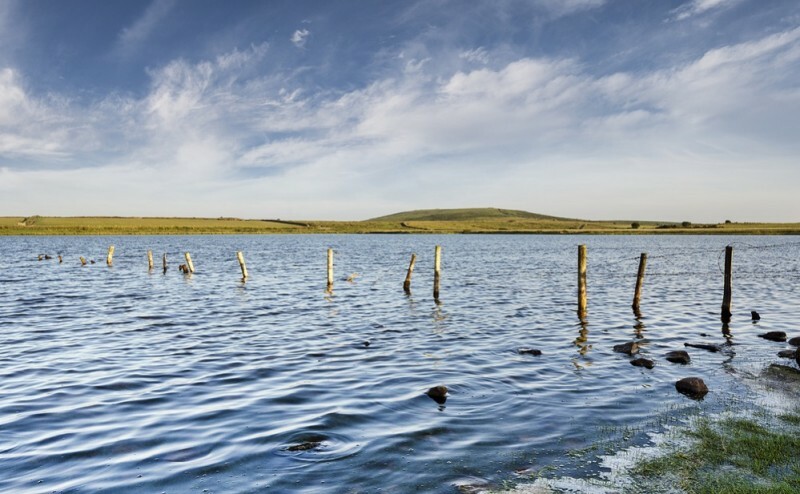 In fact, Bodmin Moor has four lakes: Colliford, Dozmary, Siblyback on the south east edge near Liskeard (where you can water-ski, windsurf, sail, kayak and wakeboard) and Crowdy Reservoir (a Site of Special Scientific Interest near Camelford that is also known for its birds). Cornwall truly is a land of contrasts. From sheer, dramatic cliffs on the north coast to gentler shores on the south, quaint fishing villages to lively towns, stark mining buildings to gracious estates and, in the middle of it all, vast areas of wild, untameable moor. Maybe Merlin did once walk this landscape, maybe Arthur did have his Camelot here and perhaps there really was an extraordinary sword called Excalibur. We’re unlikely to be able to extract fact from fiction but Dozmary Pool has been quietly lapping against its age-old banks for millennia. If vegetation, rocks and reeds could talk, what stories would they tell?